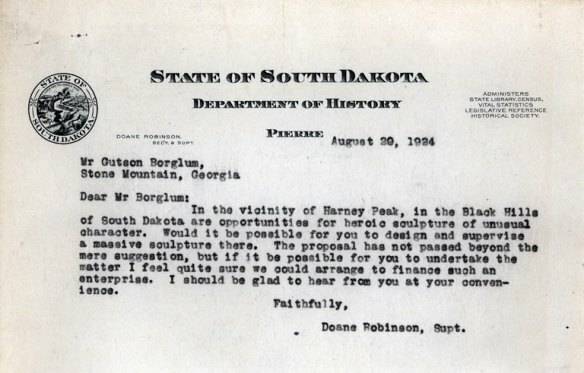 Two pieces of correspondence, one sent in August 1924 by State Historian Doane Robinson to sculptor Gutzon Borglum concerning a “heroic sculpture of unusual character” in the Black Hills of South Dakota, and Borglum’s reply to that request are currently on display in the research room of the South Dakota State Historical Society-Archives at the Cultural Heritage Center in Pierre. The State Archives is open Monday through Friday and the first Saturday of the month from 9 a.m.- 4:30 p.m. CDT. There is no charge to see the exhibited letters. The correspondence highlights the first contact between Robinson, who had the idea to carve significant sculptures in the Black Hills, and Borglum, the future carver of Mount Rushmore. This initial communication was the genesis for a carved national monument in the Black Hills of South Dakota. In January 1924, at a meeting of the Black and Yellow Trail Association, Robinson gave an address titled, “The Pull of the Historic Place,” emphasizing the importance of bringing tourist traffic through the state. Robinson’s initial idea was for carved monuments in the Black Hills, specifically using the granite “needles” in Custer State Park. In Robinson’s mind, the sculptures were to specifically highlight South Dakota’s history. His early proposal included historic figures such as Lewis and Clark, Sacajawea and Red Cloud. But Robinson needed a sculptor. Borglum came to South Dakota in September 1924. While in South Dakota, Borglum toured Custer State Park, spent the night at Sylvan Lake and climbed Harney Peak. Emphatically, Borglum began talking of a great national memorial in the Black Hills highlighted by carvings of George Washington and Abraham Lincoln. His visit to the Black Hills encouraged Robinson and brought state and national publicity to the notion of a carved monument project in South Dakota. A sampling of books from the State Archives library will also be on display alongside the correspondence. Since the completion of Mount Rushmore 75 years ago numerous books have been researched and written to commemorate this historic project. These books about Borglum and Mount Rushmore are available in the research room during open hours.